The first build a trellis project is a wood trellis. Pre-made wood trellis panels make it easy to design and build a custom trellis design for your garden or landscape. Wood trellis panels are available in most garden centers and are easy to cut for a custom design. Most of the supplies you will already have on hand! 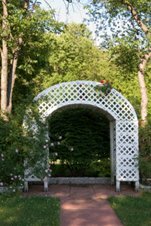 Follow these easy steps for a custom trellis design. What style is your garden or landscape? Do you want a straight, rounded, or curvy top? Will your trellis rest against a wall, or be a stand-alone structure? 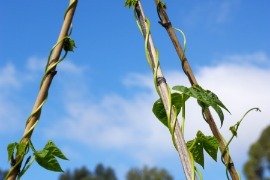 What type of climbing vines or plants will the trellis support? 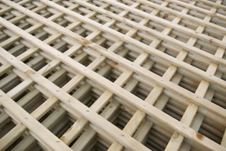 If the trellis design is a stand-alone structure, assemble the panels using a nail gun or hammer to drive in the nails. Attach the decorative moldings around the panels using a nail gun or hammer. Fill in the nail holes with wood putty. When putty is dry, sand it down until it is smooth. Apply stain or paint. Be sure to allow the stain or paint to dry completely. If your trellis is a free standing structure, your design is complete. For a trellis design that needs wall support, attach 4 X 4 inch wood blocks between the wall and the trellis using the hand gun or hammer. The second project is a simple wire trellis. This type of trellis design is simple to construct and does not need additional support. Pull the wire from the spool (leave wire attached to the spool for now). Tightly wrap the wire around one end of the poles (approximately 3-4 inches from the end). Lay the second pole on the ground next to the first wired pole. Be sure they line up evenly. Wrap the wire around both poles by weaving the wire in and out of the two poles (in a figure eight motion). Wrap each pole at least four times. They should now be wired together at one end. Lay the third pole next to the second. Wrap the wire in between the second and third pole using the figure eight technique. Wrap each pole a minimum of four times. Twist the wire around the starting end to keep the wire secure and prevent unraveling. Use wire cutters to cut the wire. You can now spread out the poles and stand the trellis up like a tripod. You can also search for free trellis designs, plans, and building tips online if you want additional ideas for how to build a trellis.